As the dust now settles on Prime Minister Narendra Modi’s historic visit to Iran in May, much has been said and written about the possibilities, opportunities and interests that could benefit India. It could be argued that Modi’s visit to Iran was somewhat tardy, considering the diplomatic rush to Tehran as it opened up its vast, untapped economy to the world after the success of the nuclear deal with the West. To put things in perspective, however, this important visit was a corrective measure and not any sort of historic diplomatic coup orchestrated by the government. Modi’s visit was very well laid out, with Nitin Gadkari, Minister for Road Transport, Highways and Shipping, Dharmendra Pradhan, Minister for Oil, and Sushma Swaraj, Minister of External Affairs laying the groundwork on crucial topics of oil, gas, trade and of course the India-Iran albatross known as the Chabahar Port project. Modi’s trip began by creating some more goodwill, and maneuvering room with Iran as India released more than $700 million in due oil payments to Iran. This was just a fraction of the $6 billion that India currently owes; it has been steadily depositing the cash into a UCO Bank account in Kolkata. Previously, during its peak sanctions period, Tehran exerted tremendous pressure on India to release this money, while New Delhi balked in the face of pressure from Washington. While Modi’s trip would have calmed many nerves in Iran, it is important not to oversell what both the prime minister’s visit and Chabahar Port itself can do for India, even assuming New Delhi manages to complete the project. A better understanding of Iran itself is required in the Indian public discourse, most importantly more insight into the complicated and factionalized nature of Tehran’s polity. 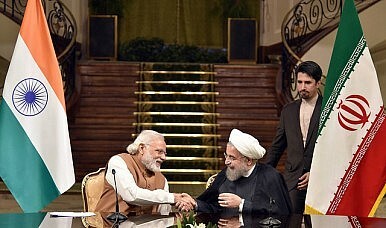 The main positive from Modi’s visit was that both India and Iran decided to move out of the spiral of signing memorandums of understanding with each other over the Chabahar project. During his visit, India, Afghanistan and Iran signed a trilateral trade treaty for developing the port project and beyond. More significant is an agreement between EXIM Bank of India and Iran’s Ports and Maritime Organization (PMO), which would make a credit line worth more than $150 million available for the project. However, even though all these arrangements are certainly positive, the project is still far from implementation, with much diplomacy and negotiation still remaining. However, the importance of Chabahar for India’s strategic interests is perhaps overstated. The majority of discourse around India-Iran relations revolves around Chabahar’s strategic placement more than its economic reach. While both these optics of diplomacy are increasingly entangled in today’s globalized version of diplomacy, strategic alignment with Iran is no easy task, for any country. A lot of discussion around Chabahar’s importance for India revolves around seeing the project as some sort of deterrence to the development of Pakistan’s port of Gwadar, which is now fully run by China. But many seem to forget – or perhaps they just overestimate India’s influence – that Iran is one of the two regional hegemons in West Asia, and both economically and militarily is a powerful force to reckon with in its own right. Moreover, Iran is extremely shrewd and works tactically and often brutally to diminish compromises in diplomacy against not what it needs, but what it wants. Chabahar as a project, and an Indian interest, needs to be seen both through a lens of reality and from an Iranian perspective. In November last year, reports suggested that the PMO was intervening in the languishing port project, and was looking to expedite the credit line for it. At the same time, however, Nawab Sanaullah Zehri, the chief minister of Pakistan’s Balochistan province, and Iran’s Sistan-Baluchistan Governor Ali Oset Hashemi agreed to make Gwadar and Chabahar “sister port cities.” Both Hashemi and Zehri announced plans to connect the two ports with railways, new shipping routes, and mentioned the possibility of direct flights. After Modi’s visit, it didn’t take Tehran long to disassociate itself from any idea of Indian exclusivity to Chabahar Port. After Modi met both Rouhani and, more importantly, Ayatollah Khamenei, the supreme leader of Iran, Indian hopes of hegemony in the port project were challenged. Iran’s Ambassador in Pakistan, Mehdi Honerdoost, soon after said that the port agreement between India, Iran and Afghanistan was certainly “not finished” and that Chabahar development was “not limited to these three countries.” And it is highly unlikely that Honerdoost was out of step with Khamenei’s own thinking. This is also a pivotal part of understanding Iran’s politics and economics. While the moderate Rouhani and his government, though powerful, seem eager to open up to the world, internal political challenges are rife. Khamanei and the entities he directly controls, such as the very powerful Islamic Revolutionary Guard Corps (IRGC), also have large vested interests in the country’s economy. This is also an area where serious corruption often thrives, and many of these entities and people associated with the likes of IRGC are on various blacklists around the world. While the IRGC’s influence within Rouhani’s circles is comparatively limited compared to its clout under former president Mahmoud Ahmadinejad, it still exists and Rouhani has a challenging and often controlled environment to maneuver in as far as economics go, specifically strategic plays such as Chabahar. Another aspect of international diplomacy, which cannot be discounted in the context of Chabahar, is China. Tehran has said that both Islamabad and Beijing are welcome to take part in the development of Chabahar. More than China, for Iran, maintaining good relations with Pakistan is also proving to be of the utmost importance and will be factored into the India dynamic as well, albeit not very overtly. But it will come into play in how India sees the Chabahar project. Just promoting historical cultural and political ties with Iran will not cut it. Tehran is at a point where it wants to see cash on the table. With an economy suffering from international sanctions, and a large “youth” demographic that wants education, jobs and prosperity, Iran will soon have many options, including from the West, to attract heavy investment, specifically in areas such as energy, manufacturing and perhaps even services. Time is of the essence, and Indian diplomacy will need to move swiftly to maintain its space in the country. India understands these realities well, and it has made some good progress. The fact that Tehran agreed to keep the giant Farzad B gas field exclusively for Indian investment, and not open it to international bidding, is a testament of seriousness on the part of the Iranian government. But Iran is a country that feeds and thrives on tough negotiation and diplomacy, and its experience in this respect is at least equal to India’s. New Delhi should be prepared to play this game just like the Iranians do. In fact, this will be to the benefit of both countries. The Indian prime minister has some important tasks for his trip to Iran later this month.